Have you met Mike Corrado? Mike not only stands behind our country each and every day fighting for our freedom and safety, he also stands behind a microphone performing his music to audiences not only here in my local area of eastern coastal North Carolina, but around the country . 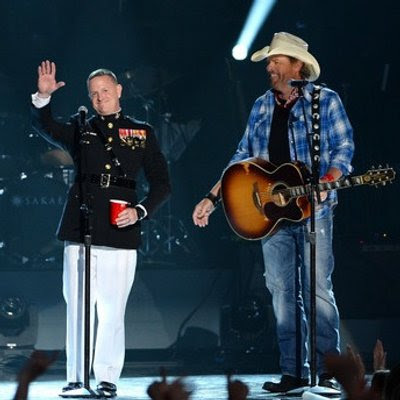 Well, we started listening about 7 years ago and music fans really started paying attention when Mike took the stage with Toby Keith to perform "Call A Marine" for the May 20, 2014 televised special "ACM Presents: An All-Star Salute to the Troops." We love him around here and we hope you do too! Mike Corrado first bent the ear of radio stations and was featured on outlets like CMT and Armed Forces Radio and Television and others with "Stand", his 2010 single and video, a loving dedication to those who serve in our military and their families who support them. A few years back, Mike took a leave from service and put his heart and soul into writing and performing music, hitting the road and performing wherever he could to whoever would listen.Duing that time, Mike shared the stage with big names like Edwin McCain and John Mayer. That time off would soon come to a quick halt with the events of September 11, 2001 when the terrorists brought down the World Trade Center. Mike was again mobilized, proudly put his uniform on and hit the front lines with the Marines for a year in Fallujah, Iraq. Mike didn't let the events going on around him keep him from music, he let it fuel his fire and gave him even more reason to write and record from personal place. Mike wrote, recorded and released a video for "Still in the Fight" to raise awareness for those wounded in service. The song made such an impact that it was turned into a documentary which was released on DVD. You can read more about that at http://www.stillinthefightfilm.com. Mike released a feel good single recently called "Beach Bar" and the video came out last week. Check it out below. The song is available on iTunes and most digital outlets. If you download, please do it via a reputable source that pays royalties and be sure to leave a review! I hope you'll connect with Mike, listen to his music and let him know that you appreciate his service and his music. Mike, thank you from the bottom of my heart and with gratitude from my family for all that you do. Connect with Mike online at www.mikecorrado.com and get social on Twitter at @mjcorrado, on Facebook at www.facebook.com/corradomusic, Instagram at @themikecorrado and Youtube at www.youtube.com/user/mcbgrunt.